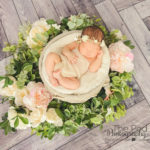 Newborn Photographer Torrance, Best Baby Pictures - Los Angeles based photo studio, The Pod Photography, specializing in maternity, newborn, baby, first birthday cake smash and family pictures. 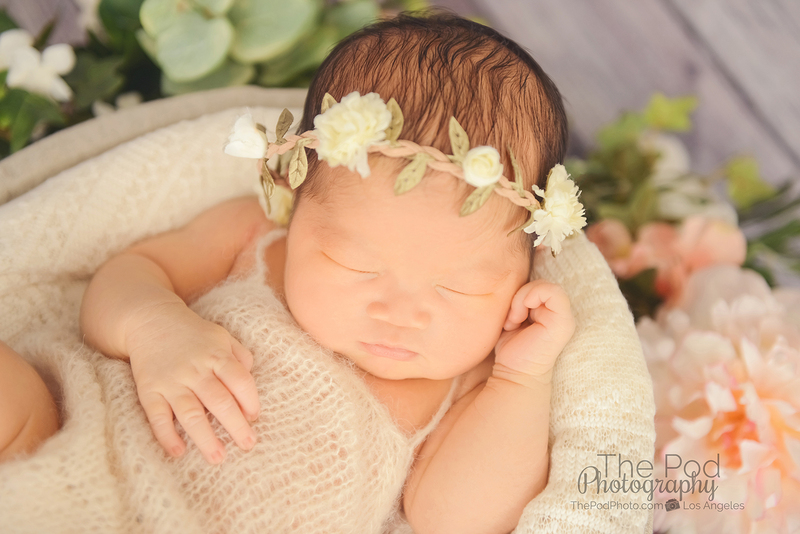 At our Torrance photography studio – we see many newborn babies! 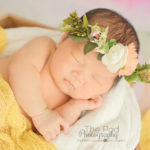 We see ones born at term, preemies, chubby babies, long and skinny babies, Mongolian marks, stork bites – each baby is unique and beautiful in their very special way. 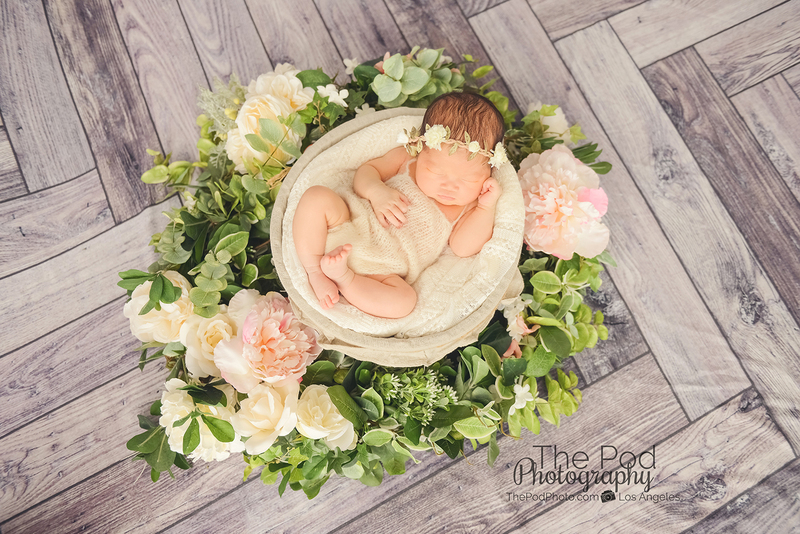 However, one of the most immediately noticeable differences between our baby clients is how much hair they have when they arrive for their photo shoot. 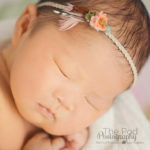 When I was pregnant with my daughter I would meditate each morning. 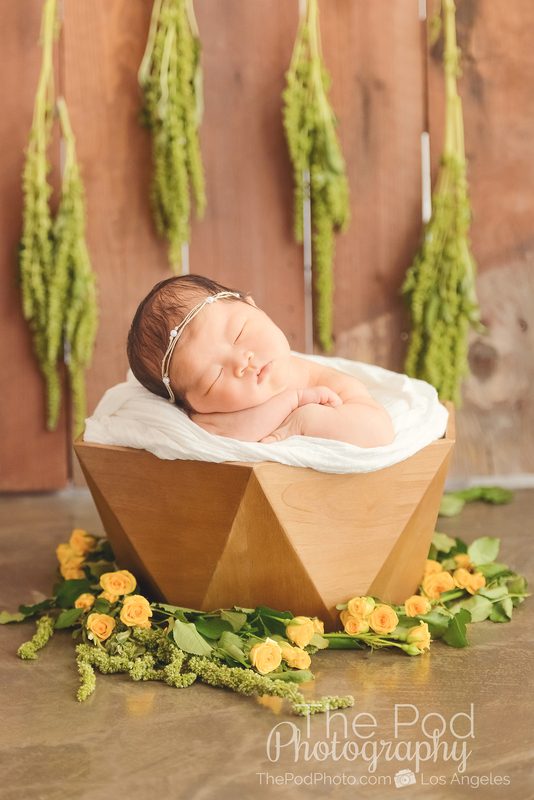 I focused on my breath and blood-flow and told my body to give all of my nutrients to her so that she grows strong and healthy. 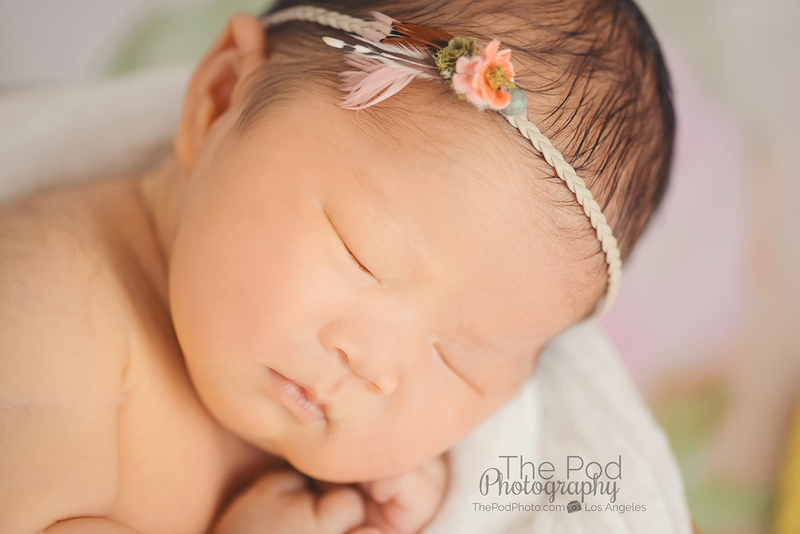 I imagined her eyes and pictured her face and tried to will my body to grow lots of hair on my little girl’s head. 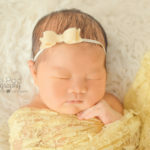 For some reason, I really wanted her to have a nice head of hair – after all, aren’t babies with lots of hair super cute?! 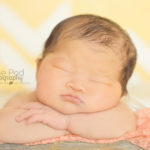 I had terrible heartburn in the last half of my pregnancy and every time I had it I would say “It’s ok that you are giving me this heartburn, baby, I know it’s because you are growing lots of hair like mommy asked!” When she was finally born she had a descent head of hair – but nothing that justified all that heartburn! 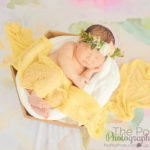 As a professional newborn photographer I was a bit disappointed that her she wouldn’t have luscious locks in her baby pictures. 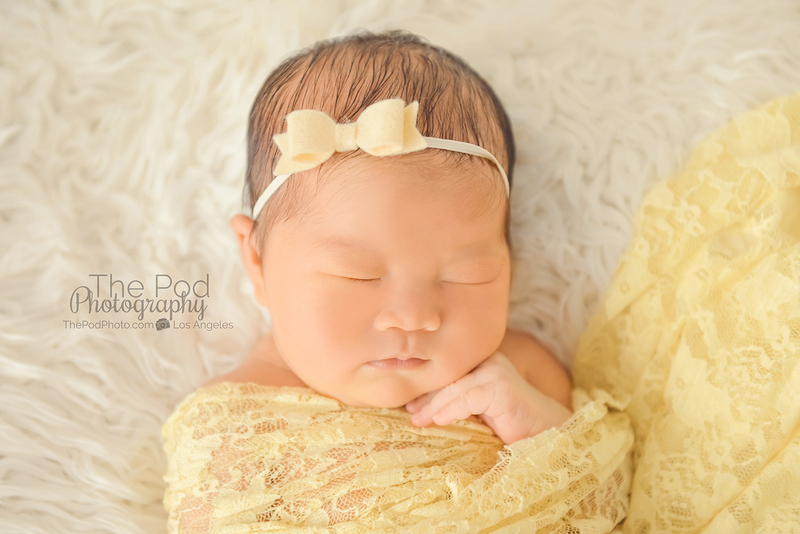 However, we love her just the way she is, and her newborn pictures turned out amazing! 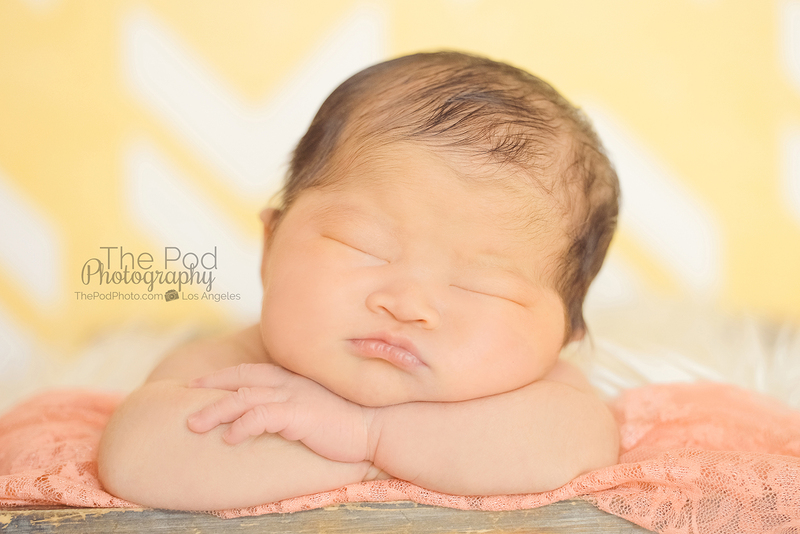 You can see her photos as well as lots of other cute babies we have photographed on our website. 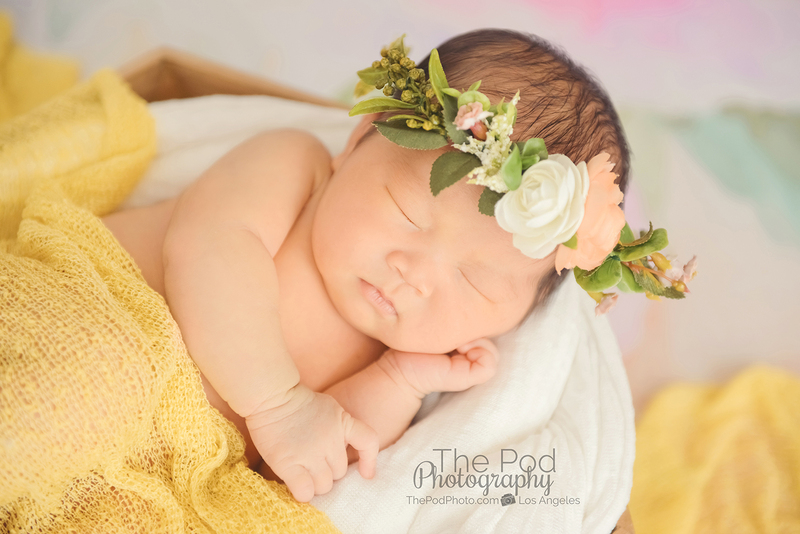 Since having my daughter – I survey every client who hires us for their newborn pictures. 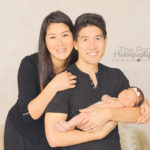 I ask the moms if they had heartburn during their pregnancy when their babies have a full head of hair and even sometimes when they do not. 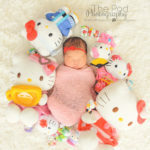 The answer – I am sorry to say, is totally inconsistent! 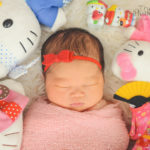 I have moms whose babies have just a tiny smidgen of hair tell me they lived off of Tums because their heartburn was so bad – and others who did have a single day of it even though their baby has inches of hair. 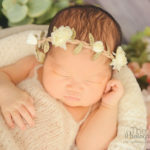 Therefore – based on my very scientific analysis – I say that the old wives tail that having heartburn means that your baby will have a lot of hair is FALSE! 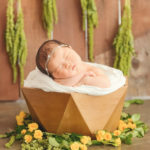 The baby in this photography session had a fabulous head of hair on her! 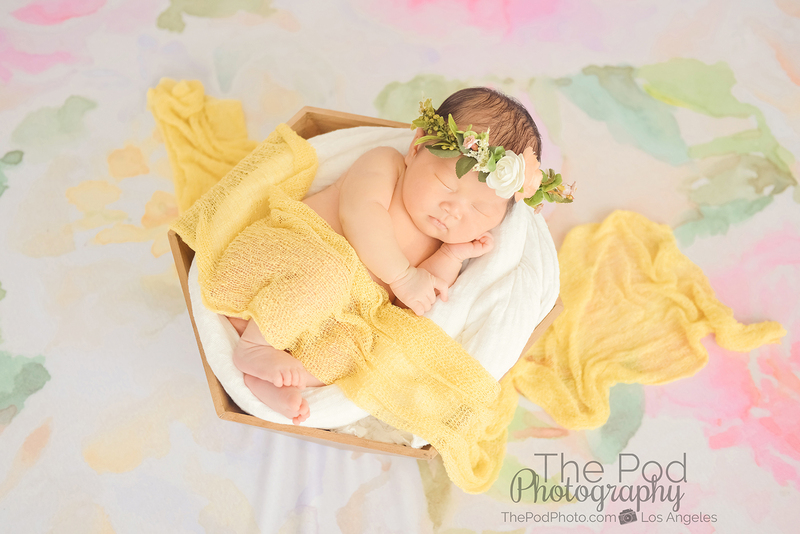 Her newborn pictures were fresh, bright and floral inspired since her name is Summer. 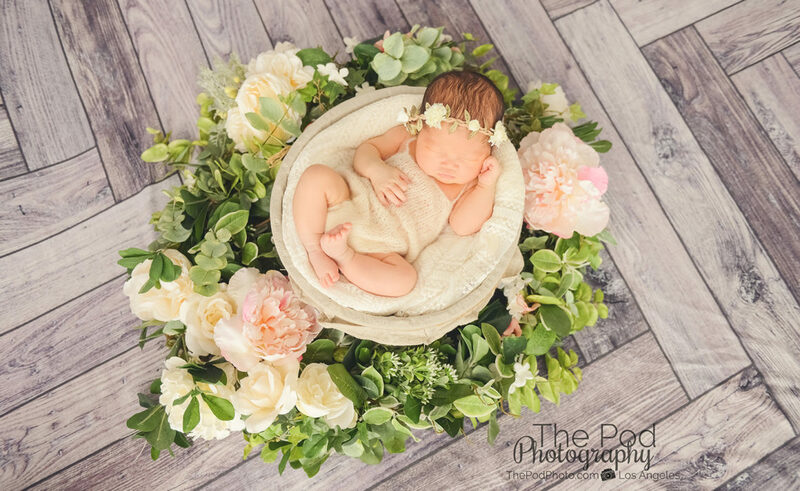 Our professional baby photographers specialize in newborn pictures of babies between the age of 5-10 days in the Torrance area. 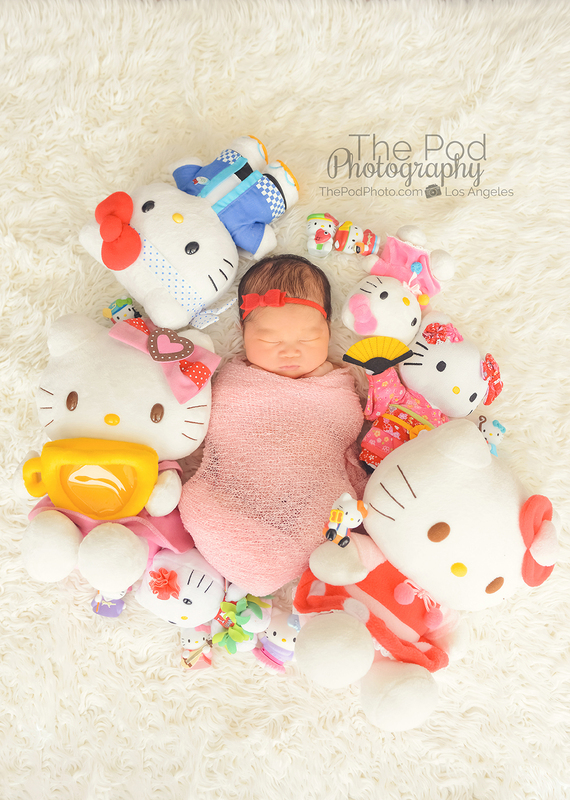 We generally book up for these highly sought after sessions months in advance, since we accept due date reservations on our calendar. 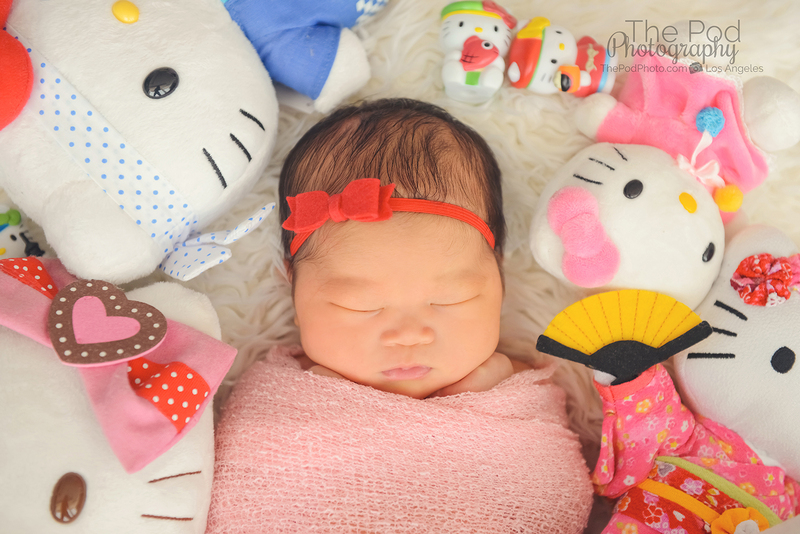 Then, once the baby is born, we schedule their photo session. 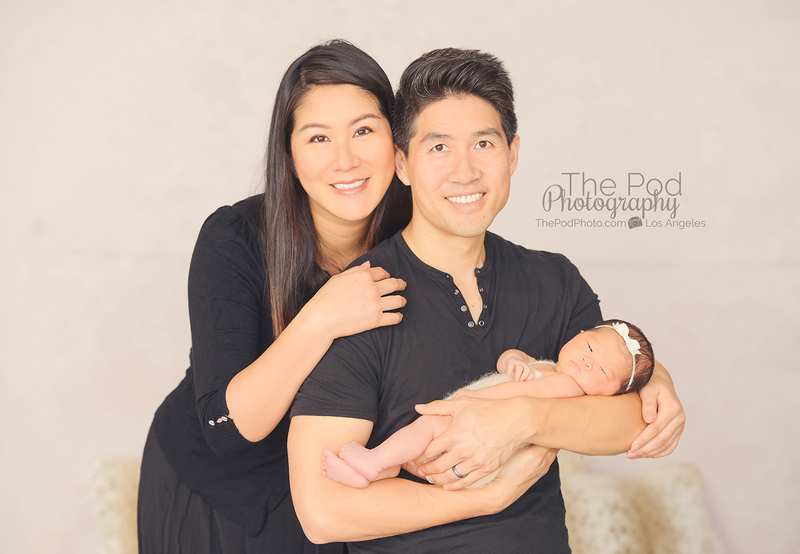 If you would like us to capture your infant’s milestone photos, contact us at 310-391-4500 to start the planning process!